The East Prussian border was threatened. The enemy had succeeded in reaching Wilkowischken. Counter measures were initiated. During the night of 8/9 August, heavy Panzers, Artillerie, Fusiliers, Grenadiers and Flak came rolling together on the roads Ebenrode-Eydtkau-Wirballen and gathered in the assembly area. It is the best division in the East, "Grossdeutchland" with its attached units. The fire fighters of the East as they are called. It had the objectives of pushing back this corner of the Front and to retake Wilkowischken. The assembly area was lit by the dawn and quiet reigned. A gigantic portrait of military might and power had gathered here in a confined area. Punctually at the ordered time for the attack, the motors started and their droning ripped through the still of the morning. Like an avalanche, the impregnable spearhead rolled toward the enemy main battle line and bored through. Closely followed by the Fusiliers and Grenadiers enlivened by a spirit to attack against which every resistance must break. Also, the enemy is awakened and sent his artillery and motar shells against the juggernaut. Enemy destroyer aircraft attack in waves attempting to force a halt. Fountains of earth climb skyward. Sheds in which the enemy take cover, go up in smoke and flames. Unstoppable, the spearhead advanced toward Wilkowischken, grinding guns and positions underneath. Often in man-to-man combat, the Fusiliers and Grenadiers engage the tough and stubborn enemy. At about 1200 hours, the city is in our hands. The battlefield shows the mark of heavy combat. The enemy has lost large quantities of both men and material. Positions were established to defend the city. Toward the southeast, in the rear of the city, two Panthers pulled into their defensive area. Russian tanks were reported. Not a half hour had passed when four Russian tanks approached the city from from the southeast. They were spotted immediately, but the range was still too long. Then they disappeared into a depression. Will they come up again is the question. There, somewhat left, all four appeared in a line at a range of 1300 meters. Now their full size was seen and the defenders opened fire. Five shots quickly followed each other and three columns of smoke stand out against the sky. The fourth was lucky to turn right and disappeared into a patch of woods. Was it only an advanced spearhead? Will still more follow or were they recon vehicles? The eyes of the commanders search the terrain. But nothing stirs. Twilight slowly enveloped the terrain in darkness. What will the next day bring? Will the Russians try to counterattack and retake the city or not? The leader decided to change to another position to get a better field of fire. 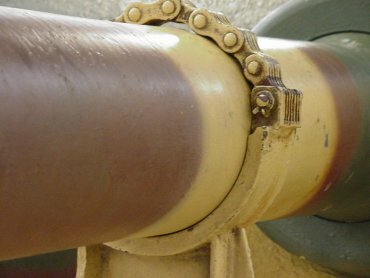 During the night running motors from moving tanks were heard. Toward morning, a Panther was called back for resupply and the other Panther had to take over the entire defense. 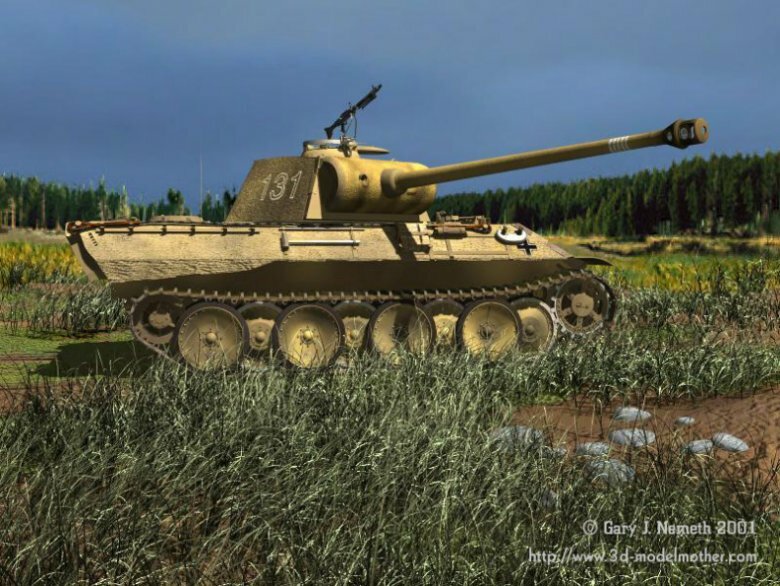 Daybreak has long since passed and an attack was not expected when out of the depression at full speed fourteen Russian tanks carrying infantry charged toward the defending Panther. 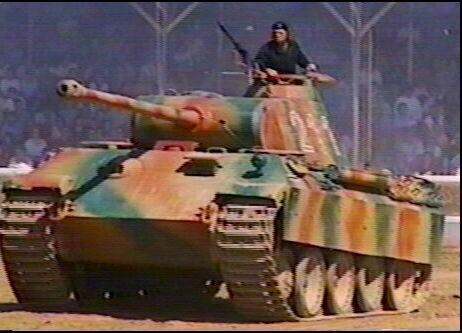 The loader was outside well away from the Panther finishing his business when shelling forced him to take cover. This made the situation more difficult. The driver took his place and fire was opened at a range of 1000 meters. Shot after shot was sent toward the attacker. The enemy had charged to within 600 meters turned right and disappeared into a hole. Four enemy tanks remained as smoking wrecks on the track. An immediate call on the radio alerted the defenders positioned further to the north. They managed to destroy six of the ten remaining tanks. Driving wildly, the rest escaped. An attack behind our front had been repulsed and cost the enemy heavy losses. Again the defending Panther changed his position. 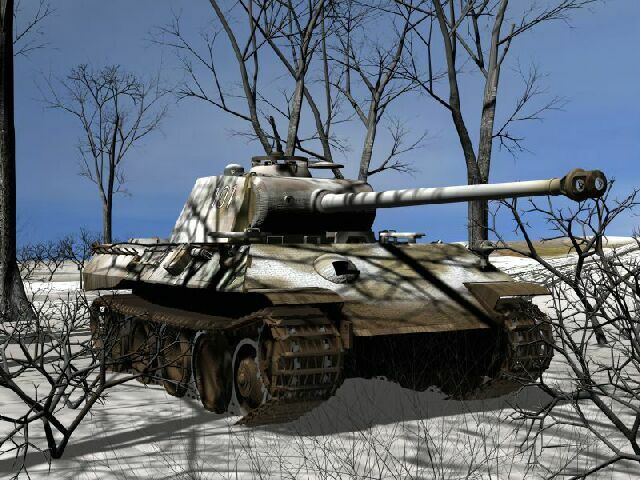 After an hour, the second Panther returned from being resupplied and took up his defensive position. The enemy hadn�t given up their attempt to enter the city. During the afternoon, the enemy with an infantry battalion supported by four SU assault guns, under cover of the tall corn fields, tried twice to break in from the southeast. But, both attacks were completely repulsed by the two defending Panthers. 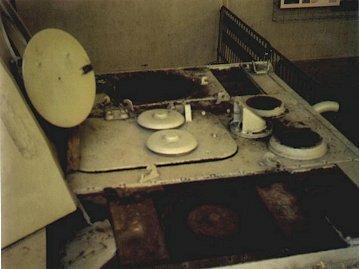 All four SU assault guns that took part in both of these attacks were shot up. Two Panthers defending the city from the south and southeast had broke up two tank and two infantry attacks. The enemy suffered the loss of eleven tanks and very heavy losses of men. 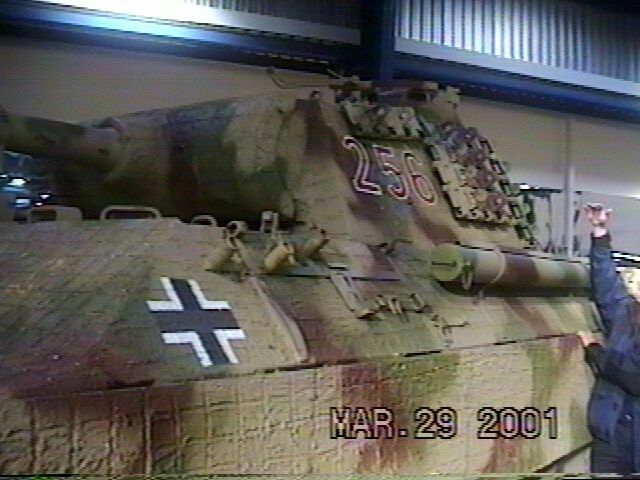 THIS REPORT AND OTHERS LIKE IT TO COME IN THE FUTURE ARE FROM GERMANY'S PANTHER TANK - THE QUEST FOR COMBAT SUPREMACY BY THOMAS L. JENTZ AND ALSO FROM OTHER SOURCES. Little story: Panthers with Infrared in Combat. 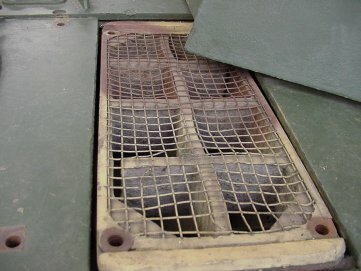 Some reports tell of a late-war combat involving IR Panthers that were equipped, which encountered a British armoured division. A British unit equipped with Comet tanks was engaged in April 1945 (at night) by some solution B-type IR Panthers. In a short one-sided firefight, the entire platoon was annihilated. Some farsighted officers of the Fallingbostel armour school formed basic tactics for equipped tank units. They planned to establish special night task forces. 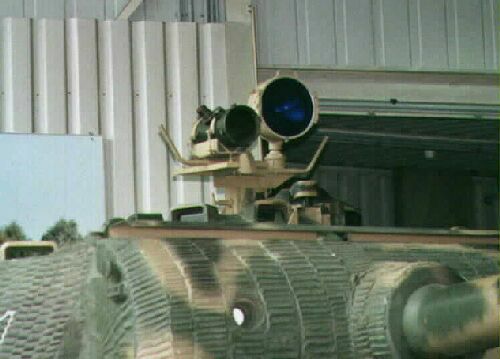 Panthers fitted with triple IR devices formed the core of these units. 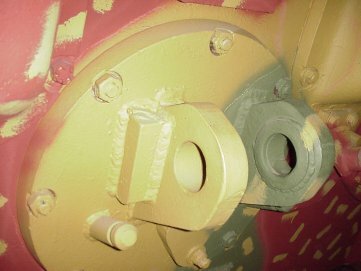 These tanks had three huge armour plates welded on the engine deck, thus offering protection on the sides and rear for three infantrymen. These troops had to protect "their" Panther with MP 44 assault rifles, which could be fitted with IR devices in its final version.[Vampir]. 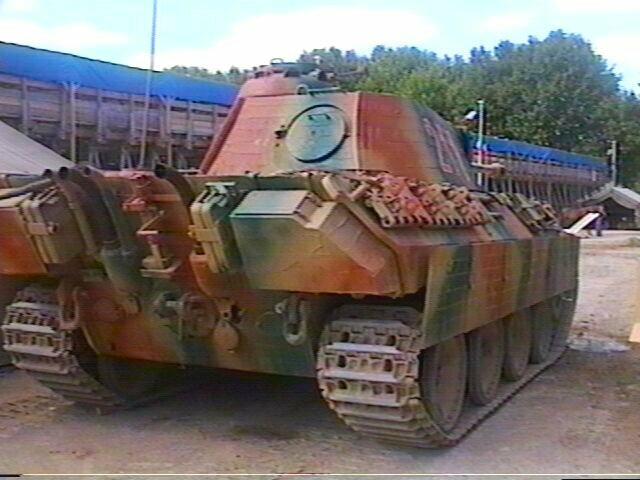 The IR Panther would be followed into combat by Sd.Kfz. 251/21 "Falke" vehicles carrying a number of infantrymen armed with MP 44s. The attack would have been backed, whenever possible, by Sd.Kfz. 251/20s fitted with 60 cm "Uhu" IR search lights. 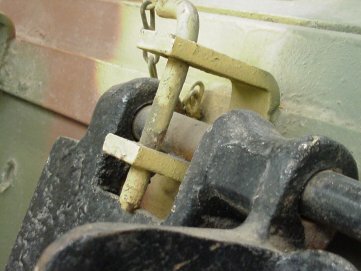 Units that were equipped in this manner would surely have had an enormous impact on enemy units that lacked IR devices. In the Spring of 1944 about 1000 IR aiming devices were ready but army officials rejected their use. The ready and working devices were stored in a salt mine in the Harz mountains. A general was quoted as saying, "We don't need any stuff like this, our soldiers will win the war chivalrously". Extract from Panther by Thomas Anderson & Vincent Wai. Click here for MORE PANZER Stories and Facts. or click on this banner below! 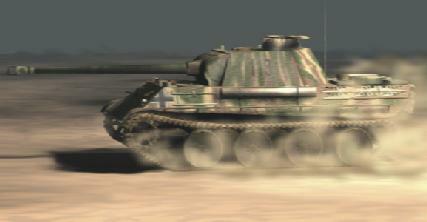 Click here for EVEN MORE PANZER Photos and Facts. or click on this banner below! GASOLINE CAPACITY 730 litres 193 US gal. or 160 Imp. gal. 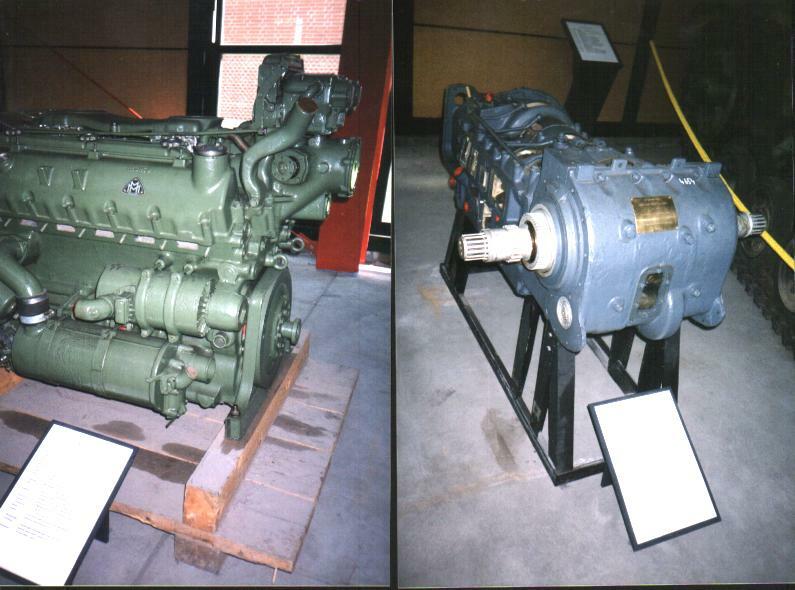 There were many small improvements to this series that improved reliability. 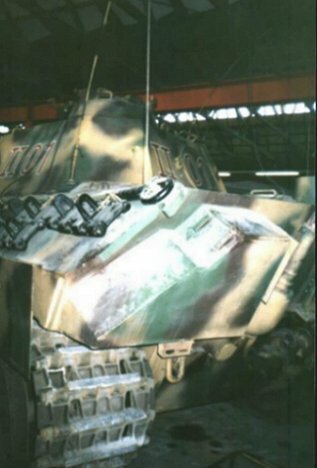 The major improvement was increased upper hull side armor. 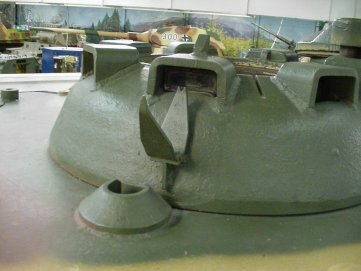 NOTE: Though not in the initial production a cupola-mounted MG-34 or MG-42 air defense machinegun was added to the Panther G's. 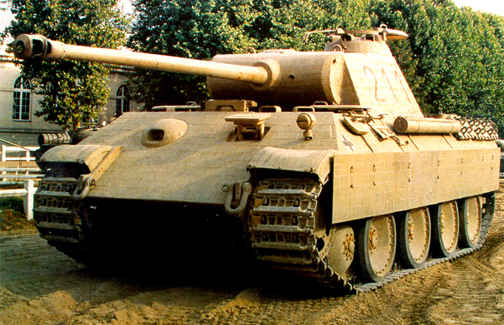 Along with the extremely effective main gun, a major asset of the Panther was the thick frontal armor. 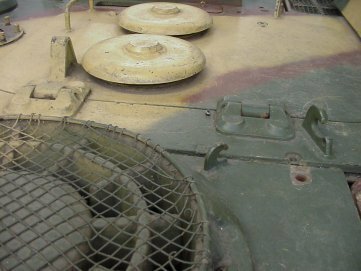 However, the sides and rear were vulnerable to attack from most tank guns including the American 75mm and the Russian 76mm tank guns at long ranges. The tables extracted from a Wa Pruef 1 report dated 5 October 1944 relate the relative ability of some the major opponents to penetrate the Panther and vica versa as shown in the following Penetration Range Table(s). 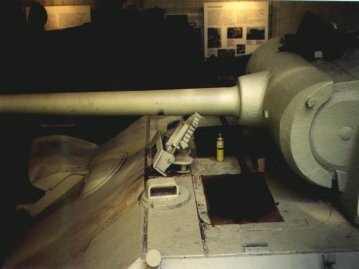 The penetration ranges were determined based on the assumption that the tanks stood at a side angle of 30 degrees to the incoming round. 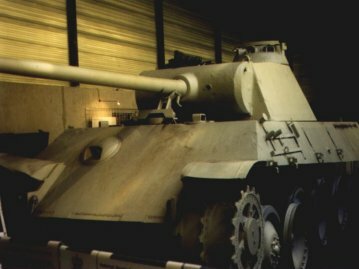 Panther 7.5 cm Kw.K. 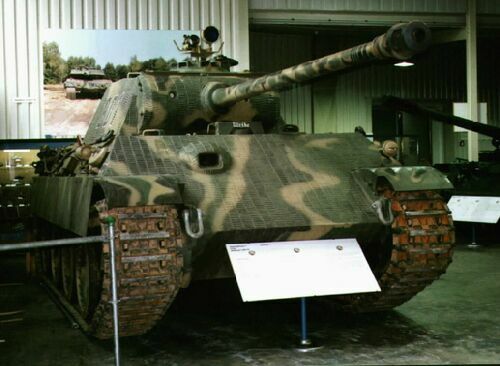 penetrates T34/85 up to: 2000m (Front Turret) 1200m (Mantlet) 300m (Glacis) 300m (Nose) 2700m (Side Turret) 2900m (Super) 3500m+ (Side Hull) 3300m (Rear Turret) 2300m (Rear Hull). 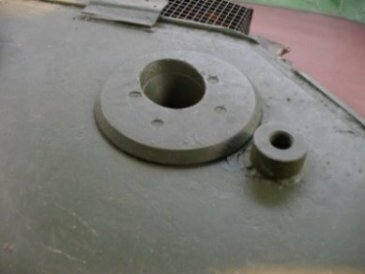 T34/85 85mm S53 penetrates Panther up to: 500m (Front Turret) 0 m (Mantlet) 0 m (Glacis) 0 m (Nose) 3400m (Side Turret) 2400m (Super) 3500m + (Side Hull) 3400m (Rear Turret) 3400m (Rear Hull). 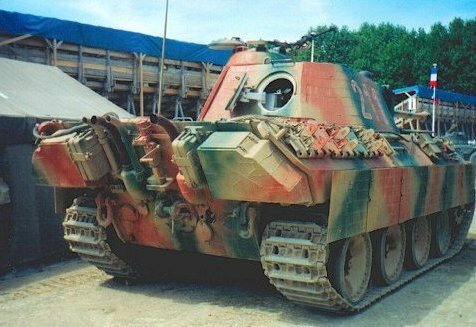 Panther 7.5 cm Kw.K. 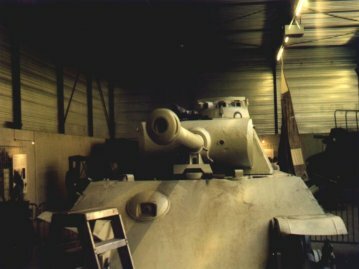 penetrates Sherman A4 up to: 2500m (Front Turret) 1000m (Mantlet) 100m (Glacis) 2800m (Nose) 3500m+ (Side Turret) 3500m+ (Super) 3500m+ (Side Hull) 3500m +(Rear Turret) 3500m+ (Rear Hull). Sherman A4 76mm M1A1 penetrates Panther up to: 700m (Front Turret) 100m (Mantlet) 0 m (Glacis) 0 m (Nose) 3500m+ (Side Turret) 2800m (Super) 3500m + (Side Hull) 3500m+ (Rear Turret) 3500m +(Rear Hull). 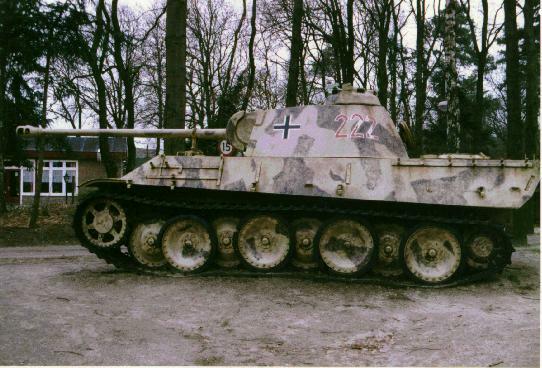 Panther 7.5 Kw.K. penetrates Churchill up to: 2000m (Front Turret) 2000m (Mantlet) 1700m (Glacis) 1700m (Nose) 2000m (Side Turret) 3000m (Super) 3000m (Side Hull) 2800m (Rear Turret) 3500m+ (Rear Hull). 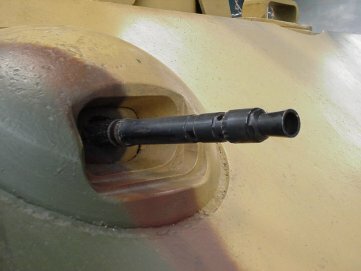 Churchill 75mm M3 penetrates Panther up to: 0 m (Front Turret) 0 m (Mantlet) 0 m (Glacis) 0 m (Nose) 1500m (Side Turret) 400m (Super) 2600m (Side Hull) 1500m (Rear Turret) 1500m (Rear Hull). 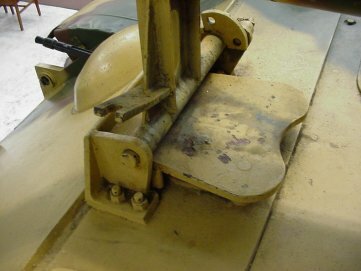 In addition, lucky hits on the lower half of the original gun Mantlet sometimes deflected downward, occasionally defeating the 16mm deck plate over the driver and radio operator. 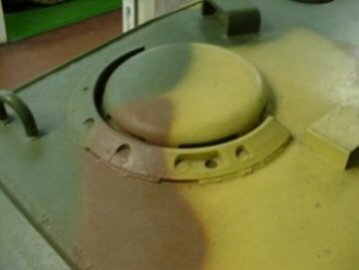 The data shows that, in a frontal attack , even the upgunned Russian T34/85 only stood a chance of penetrating the frontal armor by hitting the very small target presented by the the turret front of the Panther. 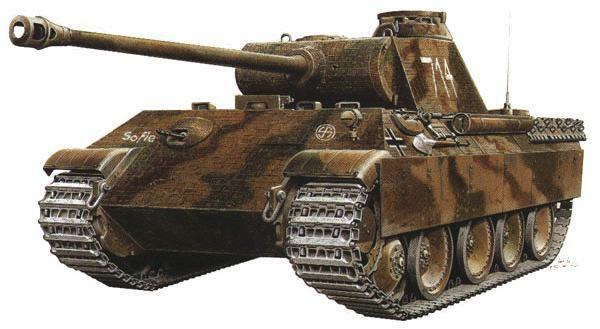 Based on Penetration ranges, without consideration of numerous other factors, the Panther outclassed all common opponents tanks and was only matched by the the Russian heavy Josef Stalin with the 122mm gun. 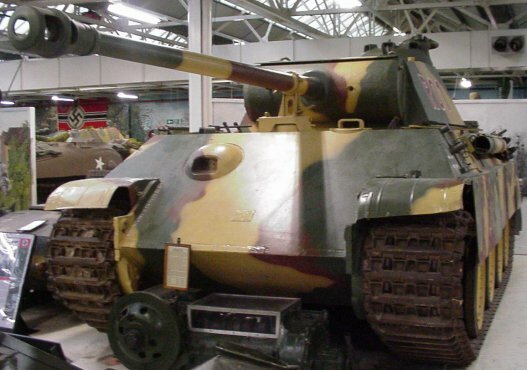 The Panther was intended as the standard tank for regular Panzer Divisions. However, on production grounds only one battalion of each regiment was so equipped. 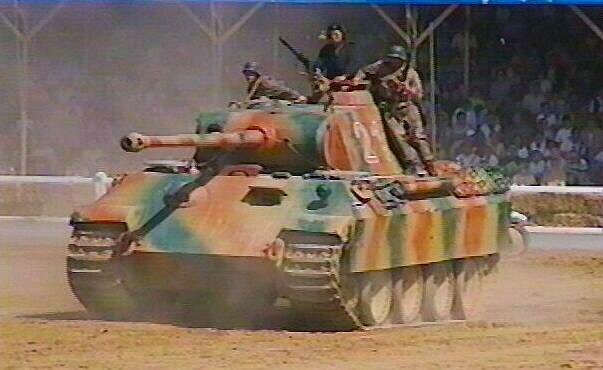 The other battalions were equipped with the Panzer IV or Sturmgeschutze (assault guns). 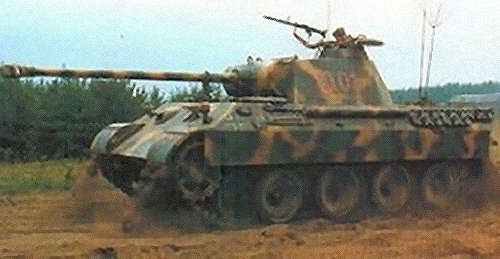 A total of 6,283 Panthers were built which included the different specialized versions (Command, Tank-recovery, Tank-destroyer, etc). 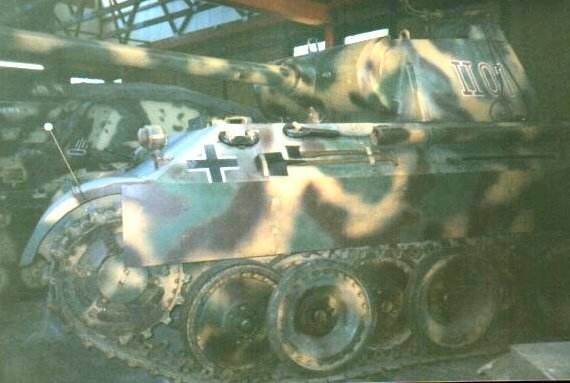 In the course of efforts to simplify production, even greater commonality with the Tiger II (Konigstiger) was planned from 1944. 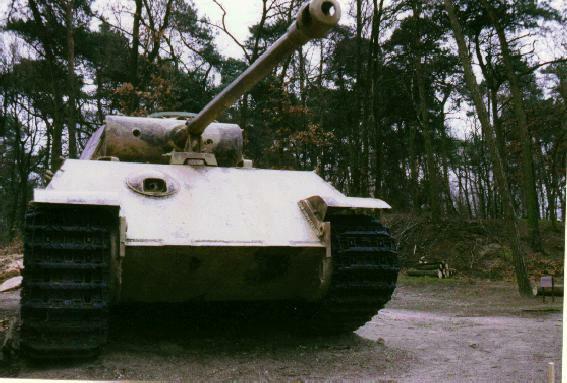 The new version was to be called the Panther II. The project got no further than the drawing board, however. 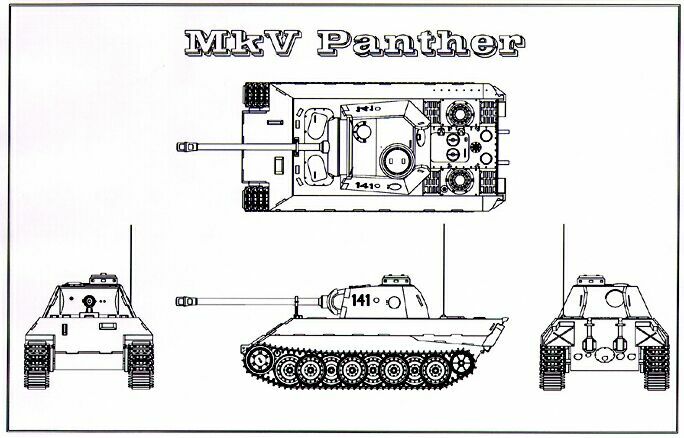 Looking back, one can draw the conclusion that instead of producing four types of tank (Panther I and II, Tiger I and II) the production of a single medium tank, the PANTHER, would have sufficed. 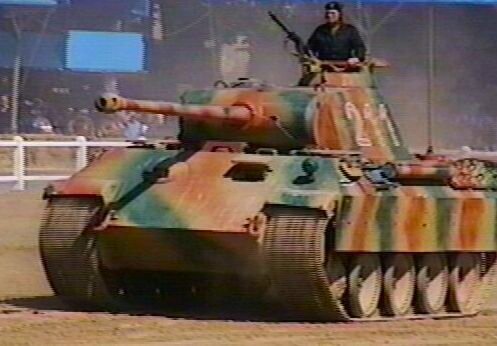 This was all that the units needed - despite the rather legendary reputation of the TIGER. So it is in the armies of today, which have only one type of main battle tank. 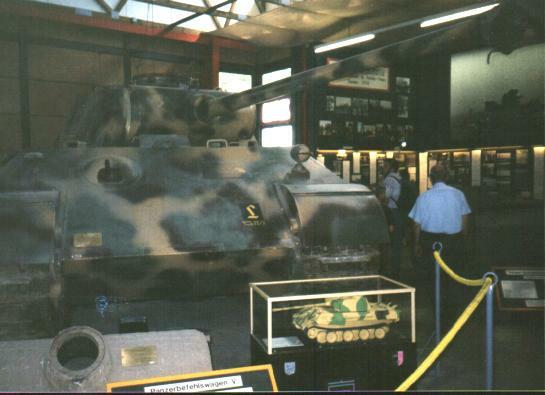 THE FOLLOWING PANTHER Ausf G IS COURTESY OF PAOLO PAESANI IN MEMORY OF HIS FATHER MARIO. THE FOLLOWING DRAWING IS COURTESY OF DAVID SHULTZ. THE FOLLOWING TWO IMAGES ARE COURTESY FROM ALAN BOOKER. 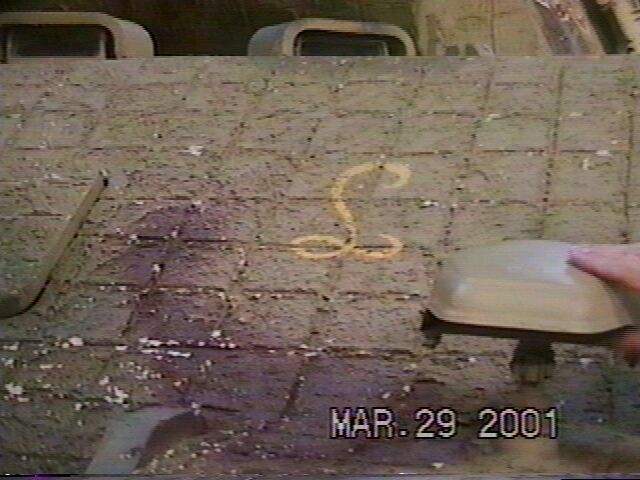 THE FOLLOWING IMAGES ARE COURTESY OF GARY NEMETH. 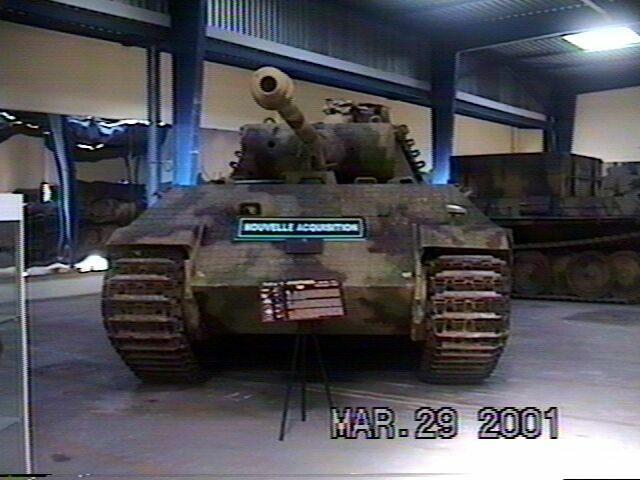 THE FOLLOWING PHOTOS OF A BEFEHLS PANTHER (COMMAND)TANK AND ITS MOTORS WERE TAKEN AT THE PANZER MUSEUM IN MUNSTER, GERMANY. A MUST PLACE TO VISIT IF EVER IN GERMANY. 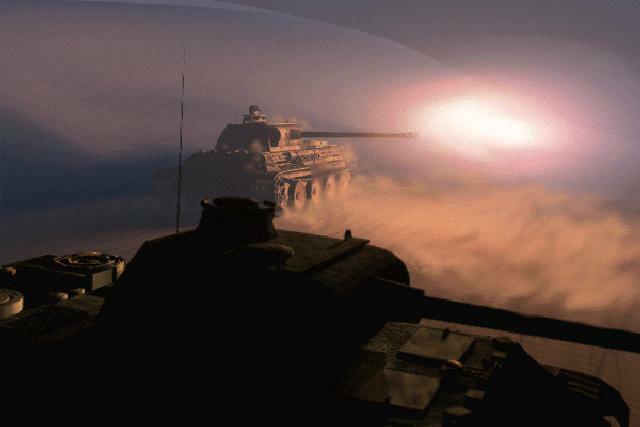 THE COMBAT MISSION SERIES ARE a GREAT superb 1-2 player, turn-based, simultaneous-execution 3D simulation of WWII tactical warfare set of games brought to you by Big Time Software and can be ordered through Battlefront.com. CLICK ON THE LOGO BELOW. My Daughter Laura's tribute Site. I miss her a lot. I must put in a plug in for my Wife's page. Check it out if you need to lose some weight. I lost several pounds, regained my health and feel so much better myself. The DietMagic stuff really works! An excellent site to visit about Canadians in WW2 plus much more interesting topics. Brandon Leniart's great site on WW 2 Photos, Facts, Biographies,etc. Jaroslav Pitonak's great site on tanks and other fighting vehicles of several countries in WW2. 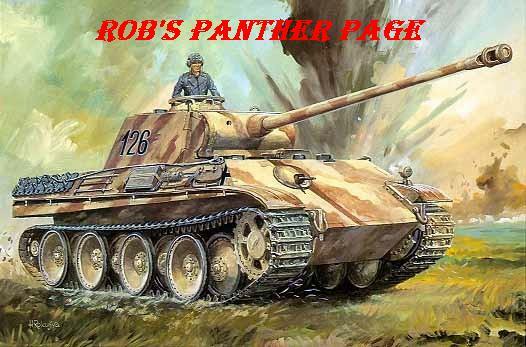 On this page you will see some thumbnailed images from several Panther Tanks in Europe today. 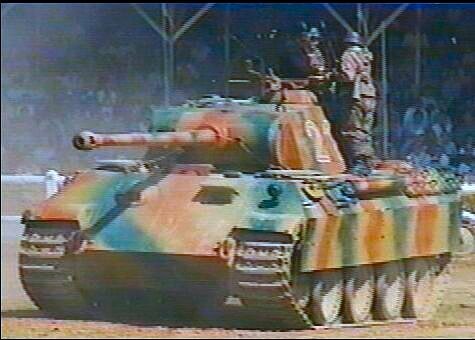 Information on the German Panzer Tanks Of WWII development history, combat service, technical data and photos. A great site! Panzer Grenadier of the German 2. Panzer Division, Panzer Grenadier Regiment 2 in areas around Ontario, Quebec and Northern New York state. On this page you will find information and photos of those who reenact this regiment and the actual unit they portray. Earn an exceptional return as a lender. Up to 1% five days a week for one year!